Be the first to share your favorite memory, photo or story of Kerry. This memorial page is dedicated for family, friends and future generations to celebrate the life of their loved one. 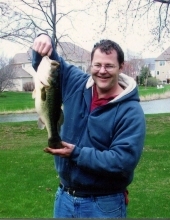 Kerry C. Lust, age 46, a resident of Plainfield, IL and formerly a resident of Naperville, IL. He was born on February 8, 1972 in Oelwein, IA. He passed away after a courageous battle with cancer on January 9, 2019 at Northwestern Memorial Hospital in Chicago, IL. Kerry is survived by his best friend and loving wife of 15 years, Marie Esposito-Lust; his cherished parents, Barbara and Dan Whalen of Naperville, IL; his brother, Matt Whalen of Wheaton, IL and sister, Molly (Kyle) McInnis of Shreveport, LA; his nieces and nephew, Malloy, Gardner and Maisey McInnis; his mother-on-law, Marlene Esposito of Plainfield, IL; his brother-in-law, John Esposito of Oak Brook, IL; his niece, Ella Esposito and nephew, Jack Esposito. He was preceded in death by his father, Larry Lust and his father-in-law, Ralph Esposito. Kerry loved spending time in the great outdoors. He was a skilled fisherman and knew all the great spots to catch the big ones. He enjoyed swimming and riding his bike. Kerry also enjoyed all kinds of music, especially The Greatful Dead. Kerry made his career in the printing industry and for the last 20 years worked at Suncraft Technologies, Naperville. He will be deeply missed by all who knew and loved him. For those who would like to leave a lasting tribute to Kerry’s life, memorials to the family to be used according to his wishes would be greatly appreciated. Visitation will be Monday, January 14, 4:00 until 9:00 PM at the Overman-Jones Funeral Home & Cremation Services, corner of Routes 30 & 59, Plainfield. A celebration of Kerry’s life will be held at 7:30 PM that evening. All are welcome to gather for final committal services on Tuesday, January 15, 11:00 AM at Bohemian National Cemetery, 5255 N. Pulaski Rd, Chicago, IL 60630. To send flowers or a remembrance gift to the family of Kerry C. Lust, please visit our Tribute Store. "Email Address" would like to share the life celebration of Kerry C. Lust. Click on the "link" to go to share a favorite memory or leave a condolence message for the family.